Great friendships, indeed, call for a celebration, and a stronger cooperation. 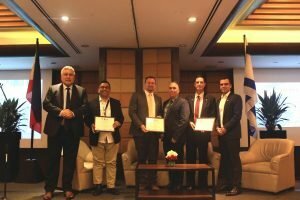 The Embassy of Israel, in partnership with the Israel Chamber of Commerce of the Philippines (ICCP) and the Davao City Chamber of Commerce and Industry, brought the Colors of Israel Business Fora to Davao last November 23 and 24, 2017. Policymakers and industry leaders from both Israel and the Philippines gathered to discuss innovations and partnerships in agriculture, cybersecurity, and tourism. The Colors of Israel is founded on the strong friendship between the two countries. Effie Ben Matityau, Israel Ambassador to the Philippines, stated that the event was a part of this year’s jubilee celebrations — 2017 marks the 60th year of diplomatic relations between Israel and the Philippines. 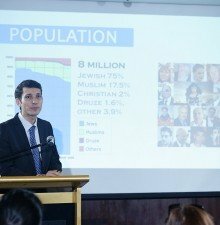 It is also the 80th year of President Manuel Quezon’s Open Door Policy, which made the Philippines a sanctuary for about 1,300 Jews during the Holocaust. Moreover, the two countries celebrate the 70th year of the Philippines’ vote for United Nations General Assembly Resolution 181, which led to the creation of the State of Israel. With a deep history of cooperation, the two nations look forward to more partnerships in key national industries. Colors of Israel kicked off with the Agri Forum: Accelerating Agriculture Innovation last month. Israeli pioneers from Netafim, a provider of smart irrigation solutions; SCR Dairy, a trailblazer in cow monitoring; and Tahal Group, a leader in sustainable infrastructure, shared their know-how on agricultural technologies. They discussed how the two countries could explore shared opportunities for a more vibrant agriculture industry. With the digital age showing no signs of slowing down, Colors of Israel opened tech discussions through the IT & Cyber Security Forum: The Road to a Digitally Empowered Society. 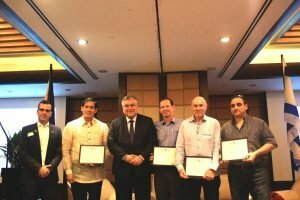 Speakers from the ICCP and Israeli tech companies in the Philippines, TrueLogic Online Solutions and Business Profiles, Inc., spearheaded the dialogue on cybersecurity. ORT Israel Network, Israel’s largest vocational and technical education system, also presented its solutions for IT education. Tourism is one of the most important sources of income of both Israel and the Philippines. As such, Colors of Israel held its Tourism Forum with Hassan Madah, Director of the Israel Ministry of Tourism, as the guest speaker. 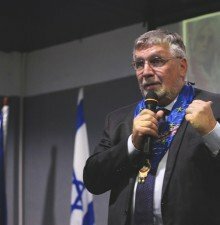 The talk centered on the Philippines’ (the largest Catholic population in Asia) intentions to visit Israel, the Holy Land. And as part of Israel Embasy’s cultural program in partnership with the Film Development Council of the Philippines (FDCP), a special screening of “Kicking Out Shoshana”(2014), an Israeli movie starring Gal Gadot- our wonder woman in her early years, will be held at the FDCP Cinematheque. The Israel Embassy and partner agencies also visited Mintal Comprehensive High School for the launch of the “Capacity Building of Teachers on Project Innovation, Science, Technology, Engineering, Arts and Mathematics” (iSTEAM) project. A collaboration between Davao City Government, Embassy of Israel, Pass It Forward Foundation, and ORT Israel Network. Twenty teachers from public comprehensive high school within Davao City are set to undergo capacity building in Israel for the implementation of the iSteam project. Davao City Mayor Sara Duterte has signed a Memorandum of Agreement (MOA) of “Excellence in Education: A Lighthouse Project with PassItForward Chairman Shmuel Weiss and witnessed by Israel Ambassador to the Philippines Effie Ben Matityau, at City Hall during the Colors of Israel Davao. This MOA serves as a declaration of commitment and partnership of the City Government of Davao, and non-government organizations from Israel and the Department of Education for the successful implementation of the iSteam. With more than six decades of friendship, Israel and the Philippines continues to forge ties rooted in mutual progress. Hopefully, this year’s Jubilee celebrations are just the start of more decades of collaboration to come.